We have a history of Employees’ Provident Fund (EPF) money being blatantly and rampantly abused by governments to buy shares and bonds in the secondary market, including the bail out of various ailing Government-linked companies. The Government has said many times that steps will be taken to secure the funds in EPF and the Employees Trust Fund (ETF). Furthermore, it has said both these funds will be amalgamated to create a new national pension plan and the combined value of the new fund will be around Rs. 1.7 trillion. The IMF has plainly stated that the EPF governance structure needs changing. The IMF has said many times that the EPF must develop a “sound, robust and independent governance structure with the clear objective of seeking the best investment returns for members, while taking into account reasonable levels of risk tolerance and the individual preferences and circumstances of workers”. The Prime Minister has also said that he will not leave room for politicians and officials to waste the money of this new fund. Despite that assurance, Opposition politicians and trade unionists have expressed their strong opposition to a Government move to set up a common fund by merging EPF and ETF under the cover of introducing a pension scheme for private sector employees. We cannot blame them given the track record of the EPF where the CB administration has been accused of getting involved in pump and dump deals. There are many examples of such transactions that have still not been properly investigated by the current administration. For example the JVP’s North Central Provincial Council member and Chairman of the Inter Company Employees Union, Wasantha Samarasinghe, has said many times that workers will take to the streets if the Sirisena-Wickremesinghe Government lays its hands on the EPF and ETF like the previous Rajapaksa Government. 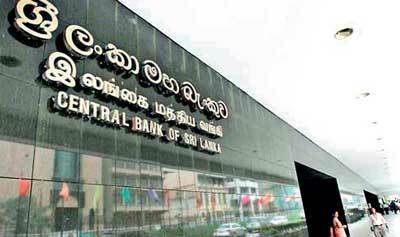 He accused the Rajapaksa Government of having invested huge sums from the two funds in the stock market in an irresponsible manner. The General Secretary of the Ceylon Teachers’ Union, Joseph Stalin, said the Government had no right to dip into the EPF and ETF according to its whims and fancies as they belonged to the workers and the Government was only its custodian. However, given that EPF is not a social and welfare financial institution and thus should not be subjected to any political pressure, a Public Wealth Trust comprising trade union and employer representatives, Treasury and Central Bank nominees, two members nominated by the Constitutional Council, two others chosen jointly by the Prime Minister and Leader of the Opposition and a Chairman and an Executive Officer could be a good option given the way it is managed now. EPF, which is under full State control, is the largest retirement fund for private sector workers. EPF has invested about 92% of its funds in government securities, 6% in stocks and 2% in corporate debt and short-term government securities. Today, what often concerns contributors to the fund are the limited benefits EPF offers them during their working life, when compared with some of the well managed global superannuation funds that fund skills development, healthcare and provide effective housing benefits. Take the CPF of Singapore. The whole scheme is tied to housing, health and a host of benefits for workers. It is also not out of place to point out that the NTUC (the only trade union recognised in Singapore) has the Prime Minister as ex officio President and that the type of tripartism practised is unique and not that different to a communist form although the economic policy is strictly market-driven. The CPF has never been accused of mismanagement and investing in junk bonds and stocks. The concern for many workers is how safe their contribution would be by the time they retire and in addition, the real value of their balance that will be available to use as retirement income. That is where the real problem lies which needs to be addressed in consultation with all stakeholders. The Prime Minister is the best person to do this. What the unions must realise is that what the Prime Minister is attempting to do is a good thing. 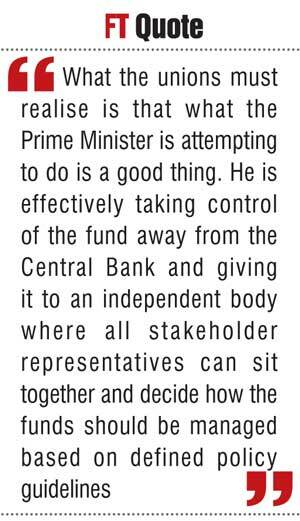 He is effectively taking control of the fund away from the Central Bank and giving it to an independent body where all stakeholder representatives can sit together and decide how the funds should be managed based on defined policy guidelines. The members can also be given two options: either to continue with the current way of doing things under a credible body to expand the services of the EPF or to create a new mechanism to pay a lump sum at retirement and retain an amount to deliver a pension for life. Or even move beyond that to create a hybrid system consisting of both options. According to the EPF Act, an employee is required to contribute a minimum of 8% and the employer a minimum of 12% of the total salary of the employee monthly, to the EPF. During the course of employment the worker derives little benefit and the benefit is fully for the State in the short term. Given the significant changes in the workplace as a result of new and advanced technology, a vehicle for skills training would also help employees remain employable during their working life and also help to grow our nation’s skills base. On the other hand the ETF board, unlike the EPF, has private sector and trade union representatives on the Board and the institution was set up to assist workers during their work life, unlike the EPF which was set up to benefit an employee when they retired at the age of 55 or 60. Furthermore, it may be also prudent for the Government to study its current and long-term funding options and the risks associated with managing the EPF in consultation with the private sector because any change that is proposed should not fundamentally alter the rights of workers over their current benefits (Gratuity and EFT) or the long-term benefit of receiving a lump sum at the age of 55 or 60. The private sector could also benefit substantially through a type of unemployment benefit scheme, which a new system can fund if properly merged. That would help companies to restructure and become more competitive and for the economy to improve its competitiveness. In the final analysis, the EPF should not continue to be a lender of last resort for the State. The fund must be committed to preserving and growing the savings of its members in a prudent manner in accordance with best practices in investments and corporate governance. (The writer is a former ETF Chairman).